It goes without saying that achieving an accurate color representation of original artwork is the desire of most artists. Artists are inherently DIYers, and their efforts at color correction can lead to hours spent tweaking images, often resulting in frustration and disappointment in the printed results. If only it were as simple as selecting the option “convert to CMYK” in a photo editing program such as Photoshop. Unfortunately, there is more to it than a mouse click. RGB images tend to darken and dull when converted to CMYK and some colors are more affected by the conversion than others. Before we can get into understanding the challenges of color matching artwork, we first need to be sure we’re speaking the same language. DPI or PPI (dots per inch or pixels per inch) These terms are most often used in reference to the resolution of an image. Most pictures on the internet are displayed at 72 DPI while images used for color printing need to be at least 300 DPI. RGB refers to the three primary colors (red, green, and blue) of light used to create color in TV’s, screens, monitors, digital displays, and so on. See how the combination of all three primaries of light results in white, opposite of what we are familiar with. This is why many find it difficult trying to adjust the colors of an RGB image. Note the mixed hues cyan, magenta, and yellow are lighter in value. CMYK is an abbreviation for the four primary colors (cyan, magenta, yellow, and black) of ink used in combination to create hue in standard printing. Notice how mixing cyan, magenta, and yellow together generates black. As artists, this is the color model most familiar to us. See how the mixed blue, red, and green hues are darker in value. Here you can see how printed dots of the CMKY inks visually merge creating a color image. A trick of the trade – magenta or a combination of cyan and magenta dots are often printed along with dots of black (k) ink for a deep, rich looking color. Take a look again at the image above, specifically the upper left corner or each color plate. Dots of cyan, magenta, and black inks are included, resulting in a more dynamic black in the full-color composite image on the far right. 1. RGB is not CMYK. For most artists, adjusting an image on the computer monitor (RGB) until the color looks perfect does not usually result in an accurate color print (CMYK) because the sources of the color primaries are different. The image is displayed in RGB and printed in CMYK. Glance back at the RGB and CMYK graphics above. Note how the mixed hues in each differ in value from their source/primary colors' value, these are examples of additive and subtractive color properties. This is one of many contributing factors that adds to the difficulty of a straight conversion from RGB to CMYK or vice-versa. A few other examples of variables to take into account when trying to color match original artwork are; having a working knowledge of the equipment, understanding the differences between screen displays and printed results, and the fact that some colors are harder to match in CMYK print, purples for instance. Did you know that giclée fine art prints are actually printed on a high-end inkjet printer that contains 8–12 different archival inks? Photo Black, Cyan, Vivid Magenta, Yellow, Light Cyan, Vivid Light Magenta, Light Black, Matte Black, Light Light Black, Orange, Green, Violet. This helps explain why giclées are more accurate in color and also why they are more expensive. Screens (monitors) are not created equal and not all viewing platforms are equivalent. The same image will appear to have subtle color differences when viewed on various screens. Even the same screen will change the way it displays color over time and depending on the amount of use. You may not be aware that professionals in the field use specialized equipment to calibrate their screen displays and output devices for accurate color every week. Color callibration chart, front and back with color recipies listed. If you really want to get serious about color accuracy – pick up a color calibration chart and include it with all high res photographs and scans of your art. The squares of color on the chart give something for a printer to reference in adjusting an image for accuracy before printing. In addition to including squares printed with 100% C, M, and Y ink, the chart also includes a value range from white to 100% black. In today’s digital photography age, this value range can help with corrections for white balance. Color calibration charts vary widely in price, here is a link to an affordable option available on Amazon. Start with the best, highest resolution photo or scan you can get. The resolution or DPI/PPI can always be reduced for various needs, such as for a website, but can NEVER be increased. Think of each pixel as a square of color, with the color squares combining together to create a reproduction of your art. When you increase the numeric DPI/PPI of an image in Photoshop, you are basically increasing the number of times that 1 square of color is sliced up into smaller squares. However, the newly created slices will still look like the original square. You are not increasing the detail of an image by increasing the resolution. This will only result in a printed image that looks pixelated. DO NOT CONVERT A 72 DPI IMAGE TO 300 DPI FOR PRINT! As a general rule, images for the internet are 72 DPI and images used for print should be at least 300 DPI. That being said, I always provide the highest resolution file to a printer I can and let them change the resolution to meet their best output. I mentioned the importance of DPI or PPI in image resolution, scaling or enlarging an image also reduces the quality of the printed picture. Think about it for a minute, if you enlarge or scale up an image for print, you are only making the pixels or squares of color print larger. DO NOT ENLARGE AN IMAGE FOR PRINT! The only time enlarging an image will work is if you start with a much higher resolution, 1600 dpi for example. This is one of the reasons to always have the photos of your artwork taken at the highest resolution possible. Quality, Time, or Cost, which one will you sacrifice? Well not really sacrifice, but you will need to decide which two of the three are most important to you. The priorities will change depending on the needs of each printing situation. For instance, if you are printing 200 postcards, time and cost may be the priority. But, if it’s 50 giclée prints, quality will be the most crucial. 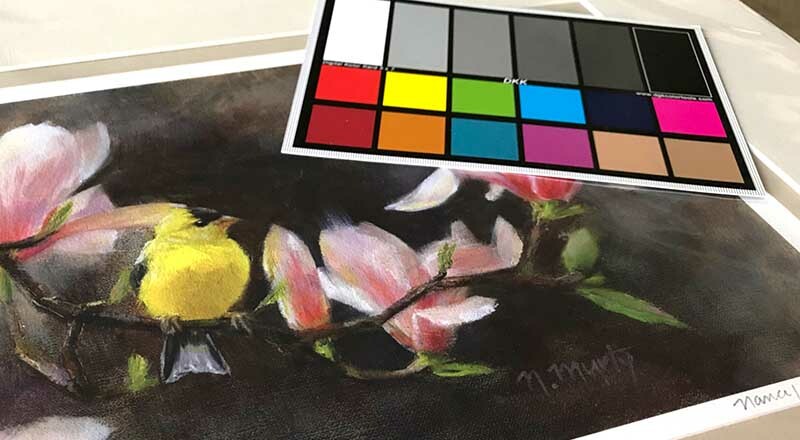 Now that you know some of the factors that are involved in getting a good color representation of your artwork in print, let’s put the knowledge to use. • Online printers such as Vista Print or Overnight Prints are great for quick, low-cost printing. Just keep in mind, the color may not be perfect in the final printed materials. There’s nothing wrong with using these printers. I’ve worked with them myself for printing business cards, postcards, and such – but I know that I am giving up a little bit of the color accuracy in trade for a low cost and quick turn around. • Looking at a digital proof online will not give an accurate representation of the color in the final printing. You should be checking for placement, spelling, and that all the information is included and correct in the layout. • To get the best quality, work with a professional printer. They are worth their expertise and experience. • Professional printers have color experts on staff that know their systems and how to adjust an image to get the best color match in printing. Color professionals also work in a specialized environment with color balanced lighting. • In addition to the high-resolution photography or scan, also include the RAW digital photo file. A RAW digital photo file has minimally processed data from the camera or other sources. This may sound really strange, but several years ago I had trouble with professionally printed images consistently looking to warm. The TIFF photos from my DSLR camera were causing the magenta dot to print a hair larger. The printer was able to correct the issue with the RAW file I provided. • Provide the original artwork for the printer to color match, I realize that this may not always be an option. Including the color calibration chart with your art in the original high res photograph or scan will also help a printer do their best color matching. Whew! Who knew there were so many factors to consider. Honestly though, this really just scratches the surface of what's involved in getting the best color reproduction of your original artwork, there is dot gain, files types, image compression, paper surfaces, and so on. No wonder you’ve ended up frustrated after spending all that time at the computer adjusting colors, and why it’s not as easy as selecting “convert to CMYK”. and passion for capturing it in paint. Click subscribe for the latest artwork and studio news and let's connect on social media. Thank you.